Peter Bogdanovich directed two of the best films of the 1970s, Paper Moon and The Last Picture Show. His career began in the late '60s, though, when he made a little-seen picture called Targets. That film, the plot of which involves a sniper, came after the assassinations of Martin Luther King, Jr. and RFK. A nervous Paramount Pictures essentially buried it. Targets has seen its reputation grow over time, and that reputation will likely continue to grow now that it's available on DVD via Warner Archive. Boris Karloff plays Byron Orlok, an acclaimed, but aging, horror movie star. He wants to retire, but a young director, Sammy Michaels (played by Bogdanovich himself) wants him to appear in just one more creature feature. His publicist also pressures him to do a personal appearance at a drive-in theater. Meanwhile, a troubled Vietnam Vet named Bobby Thompson (Tim O'Kelly) goes on a shooting rampage, eventually ending up at that same drive-in. These two plot strands end up coming together in a most unexpected and thrilling way. Targets, despite having been made over 40 years ago, remains an intense viewing experience. In some ways, it's even more relevant now than it was then, because, sadly, we've seen far too many Bobby Thompsons, especially in the past decade. The drama therefore feels very real. That Bogdanovich never provides much of an explanation for Bobby's actions only makes them creepier. The finale, set at the drive-in, is an extended sequence of immense terror, beautifully staged by the director for maximum suspense. At the same time, there's a whole other level to the story. Targets is really a horror movie about horror movies. Orlok represents the old school of screen horror: creepy castles, ghostly apparitions, dark and stormy nights. Bobby, on the other hand, represents the kind of real-world terror that far eclipses anything Orlok ever appeared in. Bogdanovich associates the two men, suggesting that (in 1968, at least) fictional horror was in danger of being made irrelevant by real life horror. Of course, we know the genre survived, yet it's also true that horror films have had to significantly up the ante to shock audiences. Both facets work marvelously, making Targets a rather unique film. It is also a picture that should be required viewing for any serious movie buff. The DVD comes with audio commentary from Bogdanovich. If you've ever heard him speak, you know he is a consummate storyteller, always ready with a fascinating anecdote. This quality is also evident in a 15-minute “introduction,” in which the director reveals how the film was made, how Paramount tried to distance itself from it, and what it was like to act alongside the legendary Karloff. Warner Archive DVDs are manufactured on demand. 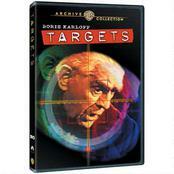 To order a copy of Targets or any of the many other films they offer, please visit The Warner Archive Collection. Targets is rated R for violence and language. The running time is 1 hour and 30 minutes.